The story of how Satyajit Ray’s masterful trilogy survived fire, decay and neglect to re-emerge anew. Lee Kline, Technical Director at the renowned arthouse DVD label Criterion Collection, is in Mumbai to attend a week-long workshop organised by Shivendra Singh Dungarpur’s Film Heritage Foundation on restoration, preservation and archiving practices. A handsomely produced book of essays, From Darkness Into Light, published by the FHF and edited by film writer Rajesh Devraj, has been released to coincide with the workshop. Among the essays is the remarkable story of how the Criterion Collection spearheaded the return restoration and return of Satyajit Ray’s Apu trilogy, comprising Pather Panchali (1955), Aparajito (1956) and Apur Sansar (1959). An edited excerpt from Kline's Satyajit Ray's Apu Trilogy. The first thing I typically do with all our films when we’re ready to start working on them is to see what materials exist for each movie: negatives, prints, intermediate films, and soundtracks. With many films this research is relatively simple: you check with the owner and get an elements list. But some films aren’t as simple. This can be attributed to several factors, including changes of ownership, storage conditions, and most consistently, poor record-keeping… Some elements are not usable when you open the can because they have turned to vinegar. When you finally find what you’re looking for, the mystery of its quality comes into play. You nervously open the cans and check if they’re complete and in good condition, or whether they’ve started disintegrating. Then comes the magic moment: a close inspection. This is typically done on a light table with a rewind setup and a magnifying viewer. Right away you can see if the film is stable, if it’s scratched, if it’s a dupe or an original, and, most importantly, if it’s scannable or printable. Upon initial element evaluations for the three films, we kept finding mediocre dupes of each film, but never the original negative... Criterion’s sister company, Janus Films, had taken in some orphaned pre-print material many years back so we also had a few dupes (donated to the Harvard Film Archive) which merited evaluation. We also found that the archive at the Academy of Motion Picture Arts and Sciences in Los Angeles had some dupes they had restored back in the 1980s. I went to LA and started evaluating the Academy materials. But then something unexpected happened. Our friends at the Academy mentioned that a few reels of the original negative for Aparajito were preserved in deep storage in their vaults…Upon investigation, we found that eleven reels of the negative for Aparajito existed, as well as nine reels of Pather Panchali and two reels of Apur Sansar. In July 1993, there was a fire at Hendersons Film Laboratories in South London. The fire was bad enough to damage many of the Ray films that had just arrived from India on their way to being preserved in Los Angeles. Luckily, even though they were badly burned, the Academy decided to have all the negatives shipped to LA and tucked them away in their vaults for the next 20 years. I was at Sony Studios’ top-notch postproduction facility Colorworks in Culver City doing some other work at the time, when the first of the burnt reels was delivered. I went down to the light table in the scanning area and had a look with one of Sony’s excellent scanning technicians. We opened one of the cans and what we saw made us quickly step back. There was indeed a reel of film in the can, but it definitely looked like it had been in a fire…We carefully took the best of the reels and slowly rewound it just enough to look between the sprockets. There was residue from tape and glue and wax throughout, but surprisingly, a decent image appeared to be lying in between the sprocket holes. I had to see what kind of image we could get out of a scan, so I begged the scanning technician to scan at least a few seconds of the reel. And he did…what we saw was gorgeous. Due to the warping, the film was very unstable on the scanner and it was moving around quite a bit, but we got thirty seconds digitized. We then took the test back to Criterion to see what our digital tools could do, and, wouldn’t you know it, we soon got some perfect images of Aparajito. …we then spent the next year trying to figure out how to work with this material. Because most of the great film technicians had either passed away or retired, this was no easy task. We spoke to dozens of people at labs all over the world, at Kodak, and at archives, and nobody could agree on the best way to handle burnt negatives…We needed an expert. We had been doing a lot of work at L’Immagine Ritrovata in Bologna, Italy, for many years… So we met them soon thereafter in Los Angeles to look at the negatives together. They had a clear plan: hydrate the film to make it less brittle, repair the splices, remove the glue and tape and wax, and fix all the sprockets. We could then do both pin-less and pin-registered scans in wet and dry gate and see what worked best (without the use of pins, the warped film could possibly move better through the gate on the scanner, but it would be less stable than using pin registration.) All this was music to my ears: it was clear that we had finally found someone with a plan that made sense. A few weeks later we received our first tests and realized that the only way to do this work correctly was to repair as much of the negative as possible and scan pin-registered wet gate. However, this approach was also the most costly… We partnered with the Academy to fund the project, and L’Immagine Ritrovato offered a substantial discount to take on the work. As the months went by, Bologna slowly repaired the negative. Some reels were beyond repair, and although others were repairable, it was still unclear if digital tools could correct some of the intense warping that happened from the heat of the fire… Since the newly repaired negative was incomplete, we would need to find alternative film for missing sections or shots. Combing the world’s archives for suitable replacements proved to be yet another challenge. Although the material from Janus and the Academy could work, we also found some fine grain positives and dupe negatives at the British Film Institute that were very good and would help a lot. Unfortunately, these were missing some shots and had black frames inserted at some point, so we needed to use the other dupes as alternatives to the alternatives. A complete assembly of the entire film was created in a digital timeline with an edit decision list identifying the best sections or shots of each film to be used. It was the roadmap that paved the way to the final restoration. Pather Panchali, the first film in the trilogy, was in the worst condition. The optically printed dissolves in the film were made crudely and quickly, and they were cut into the negative so they would snap out of the beautiful images surrounding them. Certain scenes in the negative were replaced by duplicate footage at some point in the film’s lifetime, so they looked generationally inferior to other sections of the film. Wax was put on the surface of the entire negative to preserve it, but the fire had melted it into the picture. Luckily, wet-gate scanning helped this issue tremendously. Digital repairs at Criterion proved to be the most exhausting for this film, and even with months of additional work, the final product could not be made perfectly pristine. Only about 40% of the original negative could ultimately be used in the final version of the restoration, due to either missing footage, or extreme warping of the film which made the image unwatchable. Aparajito had the most usable footage from the repaired and restored negatives. 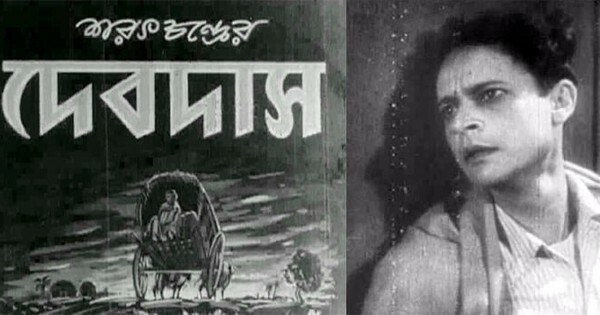 The replacement film for Aparajito was also in very good condition, so we ended up with a final version substantially better than the restored Pather Panchali. The filmmaking and editing of the film was also more advanced, so the optically printed shots for dissolves and fades were more sophisticated. We weren’t as lucky with Apur Sansar. The two reels of negative that did survive were in the worst shape out of all the reels for the three films. The footage was so warped from the fire that repairs were deemed not worthwhile. The encouraging news was that the 35 mm fine grain that we ended up using (almost in its entirety) was extremely good. It was printed well and had an excellent gray scale, so the final result is exceptional even without access to the negative. Text courtesy From Darkness Into Light published by the Film Heritage Foundation. Images courtesy The Criterion Collection.